Three of the biggest challenges for dry fire training are safety, setup time, and having to rack the slide between reps.
Now there’s an all-in-one patented solution to all of these problems called Dry Fire Cord. Hand-made in North Idaho, Dry Fire Cord uses heavy-duty, reflective cord and a color-coded, anodized aircraft grade aluminum caliber specific chamber plug to make dry fire practice with your pistol more effective than ever. Dry Fire Cord will block your chamber to help prevent you from chambering a live round. Dry Fire Cord gives you two visual indicators that the chamber is plugged. Additionally, on all semi-auto pistols that we’ve tested, including Glock, M&P, XD, Sig, Kimber, H&K, CZ, Walther, & more, Dry Fire Cord will give you a resetting trigger for dry fire reps. Removing The Click = Quicker Assessments & Improvement: When you press the trigger using Dry Fire Cord, there’s no click. The trigger just goes back and forth through it’s entire range of motion. This allows you to more accurately assess and improve how quickly you can run the trigger without disturbing sight alignment. 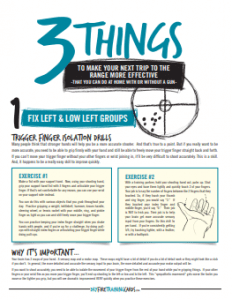 FINALLY get the trigger control you need to fix low left groups! Dry Fire Cord is the perfect solution for fixing low-left groups FAST. It lets you focus on isolating trigger finger movement without the distraction of the click or bang. Safer, more confident Dry Fire Training: You still need to be responsible and follow all safety precautions when dry firing, but dry fire cord can help you be more confident that you won’t pick up a magazine with a live round and have a negligent discharge. Rapid Setup and Removal: Unlike training barrels, traditional barrel plugs, and resetting triggers, it only takes a couple of seconds to insert or remove dry fire cord. Rapid Dry Fire Reps on YOUR Pistol Without Racking The Slide: Racking the slide between reps during dry fire is a pain…and can create training scars. With Dry Fire Cord, you can run the trigger as fast during dry fire as you do during live fire…and you’ll instantly be able to see how much your trigger press is throwing off your shot. Read Your Sights Better Than Ever: When you’re working on sighted shooting, Dry Fire Cord will let you focus on reading your sights during the trigger press without the distraction of a bang, click, recoil, or trying to see where your laser hit. Gun Safe Identification: When you have Dry Fire Cord in your pistol in your gun safe, you can instantly tell that there is no round chambered. In addition, if you own multiple guns of different calibers from the same manufacturer, Dry Fire Cord will let you instantly identify the caliber of gun you want to grab. Built rugged: Dry Fire Cord went through more than 3 years of testing and 100 refinements to get to this rugged, simple, effective tool. Every detail was thought out…from making them out of aluminum instead of plastic so that the tolerances would be tighter and they’d work more reliably to the kind of cord to use to make them last the longest and be visible in your safe or gun bag in low-light conditions. It was inspired by an instructor who showed me how to hold my slide out of battery with a piece of cardboard from an ammo box almost 20 years ago combined with a burning desire to create a safer snap cap alternative and a chamber block that actually worked and was quick & easy to use without having to disassemble the pistol. For newer shooters, this is one more level of safety to prevent negligent discharges and to give them the confidence to dry fire more often. For experienced shooters, now you can do dry fire training with your own gun that you weren’t able to do before without considerable cost & complexity. Dry Fire Cord comes in 9, .40, and .45 and 9 also works in .380s. Hi Ox, I love your training and read your emails as soon as I get them. I was wondering if it is possible to buy just one dry fire cord. As a new shooter and working on a shoe string budget I would love to buy your training package but just can’t afford it. Please let me know. Thanks for all you do. We’re getting there…I’ve been out of town for the last 4 days and will be shipping out orders from this weekend tomorrow. We’re assembling, packing, labeling, and mailing every single one ourselves right now, so I don’t want to sell them quicker than we can get them out. I’m meeting with a local group that helps disabled vets tomorrow or Wednesday to see if they have people who can help us get them ready in bigger quantities in a shorter amount of time. In the meantime, you can get them with Private Coaching or with the Draw Stroke Mastery system.